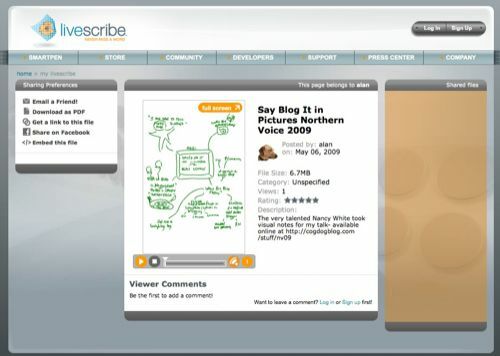 I’ve been excited about the LiveScribe pen recorder since seeing it first at a meeting last January, and then magnified by the presentation by Joe Russo at the NMC 2009 Symposium on New Media & Learning. I’d not done much with it in a while, especially with the problems I had with the 1.0 Mac Desktop software, but noted a new version had been out a few weeks– and it (mostly) works well now. I have just uploaded by first “pencast” and the newest feature is the ability to embed this into another site. Right after I got the pen, I packed it for my trip to Vancouver for Northern Voice 2009. During my presentation on Say/Blog it in Pictures I did something smart- I gave it to someone who can actually draw well- Nancy White – who took some amazing notes in my LiveScribe notebook. But up to now I only had a PDF of the notes and a separate audio file. This looks really cool. I am always sketching notes and being able to have them in digital form would me amazing. No scanner required! That is REALLY cool! Just might have to get one now. Getting a loaner from district on Saturday, so I can play with it before I purchase. I’m thinking I can grade papers and record my audio comments as I mark up the paper. Might work. We’ll see.